Mentored research that offers a rich learning experience, where students increase their understanding of the scientific process and the responsible conduct of research, as well as improve their written and oral communication skills and to gain insight into available professional paths. The majority of students entering the DVM program do so largely because of interests related to private practice. Providing veterinary students with positive experiences in research early in their curriculum is likely to encourage students to consider alternative careers in clinical or basic science. The objective of the Veterinary Scholars Program is to provide veterinary students with mentored research experiences in biomedical laboratories located within our College of Veterinary Medicine. Students are expected to complete 10 weeks of full time research over the course of the summer. In addition to working in research laboratories, there will be several joint events held during the summer for all participating students. Full participation in each activity is an expectation of each student in the program. An orientation program including lunch and seminar for scholars and their faculty mentors on the first day of the program. Goals of the program are to clarify procedures and expectations of mentors and scholars; impart a global perspective on evidence-based inquiry and technical approaches to problem solving; and to showcase NC State excellence in research. The program will be followed by lunch for the scholars, mentors and guest speakers. Seminars will be held at 8:00 am to facilitate scholar participation without conflict with their ongoing activities in the laboratory. A half-day symposium and lunch will be held at Triangle Research Institutes in Raleigh such as NIEHS, the EPA, or Charles Rivers Laboratories. The goal of this trip is to feature the unique role of veterinarians engaged in research for industry and government. Veterinarians in pathology, drug discovery and development, and laboratory animal medicine will be featured speakers. Attendance at the annual Boehringer Ingelheim NIH National Veterinary Scholars Symposium by the directors and scholars. Finally all summer research interns are expected to present results of their summer research project at the following Spring CVM Research Forum. The College of Veterinary Medicine at North Carolina State University established the Interdisciplinary Biomedical Research Training Program (IBRTP) for veterinary students to provide research training in a multidisciplinary environment. Trainees will complete a 3-month research experience in the laboratories of two faculty members drawn from seven different disciplines. Veterinary students who have completed their first or second year of veterinary school are eligible to apply. The highest priority will be placed on students who genuinely desire a research experience but have not previously had such an opportunity. Students enrolled in graduate programs, students who have received advanced degrees in science, or students who previously participated in similar research programs at NC State or elsewhere are not eligible to apply. These students may apply for any of the other opportunities listed under the Research Opportunities toggle. The NIEHS has established the Summers of Discovery Program for which Intramural Research Training Awards (IRTAs) are given to outstanding DVM and graduate students interested in pursuing careers in the biomedical/ biological sciences. Scientific disciplines within the program include neurosciences, biophysics, genetics, carcinogenesis, reproductive and developmental biology, chemistry, pharmacology, pulmonary pathobiology, classical and functional toxicology, clinical research, statistics, biomathematics, epidemiology, computer modeling and risk assessment. Funding provided by this program supports summer research for DVM students at about 20 veterinary schools. The national program encourages students to apply to other veterinary schools offering summer research programs sponsored by Boehringer Ingelheim to broaden their experiences. The participating veterinary schools are all eligible to send students to the Boehringer Ingelheim NIH National Veterinary Scholars Symposium. A group of veterinary schools have NIH-funded training programs to offer more extensive research experience to veterinary students. See the National Boehringer Ingelheim Veterinary Scholars Program website for links to these schools and for more information. In addition, the NIH has summer research internships available. The Leadership Program for Veterinary Students at Cornell University is a unique summer learning experience for veterinary students who seek to broadly influence the veterinary profession through a career in research. The program is an intensive, research-oriented learning experience that combines faculty-guided research with career counseling, student-directed learning, and a variety of professional enrichment activities. The Morris Animal Foundation provides competitive stipends to first through third year veterinary students proposing research projects, at their own school, that enhance the health and welfare of companion animals. Applicants must devote a minimum of 50% of their time to the project for an equivalent of a 10-12 week period. In October, the Office of the Associate Dean for Research and Graduate Studies will host an evening information session for all participating faculty mentors and DVM students interested in a summer research experience. The session will describe the program and various research opportunities available at the College of Veterinary Medicine. Applications from students attending other veterinary schools is encouraged. 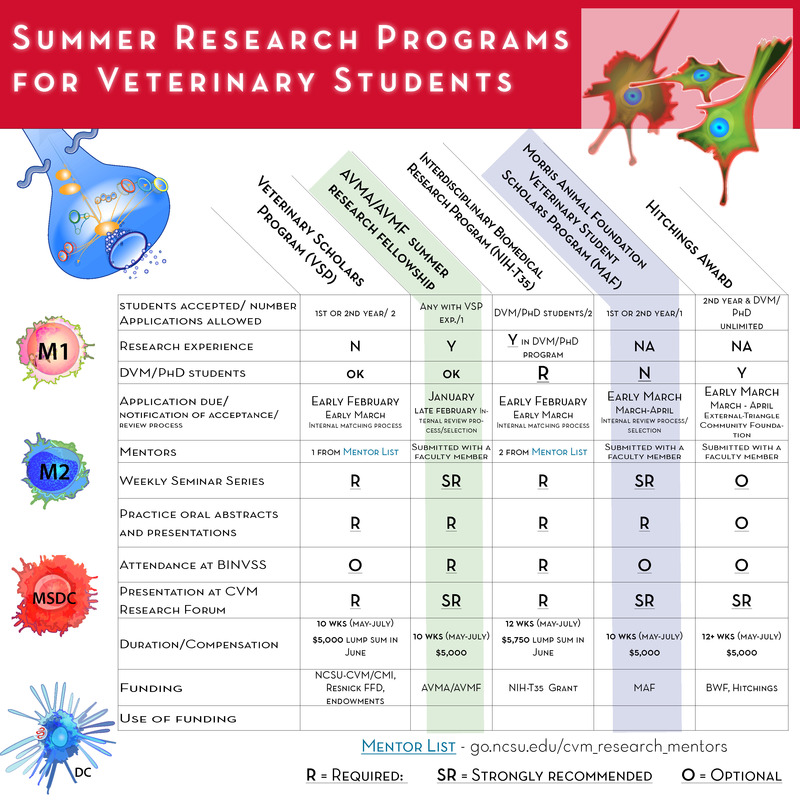 A list of other veterinary schools offering similar summer research programs can be accessed at Boehringer Ingelheim Veterinary Scholars Program. A minimum of 4 stipends will be available for participation of outside scholars in our program. Veterinary students will be invited to submit applications by February 4, 2019. In order to complete an application, each student must identify a faculty-mentor that will supervise the research internship. It is expected that individual projects will enable the student to formulate a testable hypothesis, identify specific objectives, conduct research, interpret data, present their findings in an oral abstract format, and submit a one-page summary at the conclusion of their summer experience. Students may submit applications with more than one mentor, but are limited to 2 applications. Students are required to meet with prospective mentors prior to submitting an application to work with that mentor. An open period to meet with mentors will be held during which time no commitments by either mentors or students may be made. Students will then select one or two mentors with whom to prepare an application. Students and mentors will be required to rank their proposals. The number of students ultimately matched with a particular mentor will be limited to the maximum number of students the mentor has agreed to accommodate. Our goal is to match students with their highest priority project while spreading them out amongst as many mentors as possible. Applications will be reviewed by the Associate Dean for Research and Graduate Studies and both Program Co-Directors. Successful applicants will be notified in early March. A stipend of $5,000.00 will be awarded for completion of 10 weeks of full time research. The Centennial Biomedical Campus (CBC) offers research training programs for highly motivated undergraduate students interested in biomedical research. Students will be mentored by CBC faculty, senior graduate students, postdoctoral associates and research technicians. Students will be encouraged to attend weekly laboratory meetings and CBC workshops, as available. This experience may be eligible for free elective credit through CBS 493. Students interested in research in Fisheries, Wildlife and Conservation Biology are also encouraged to apply. Undergraduate Research Application–Submit your application! If you are an undergraduate student who found a lab placement without having to fill out the above application, we ask that you provide your information through the link below. This is to ensure you are given proper badge access, paperwork, listserv access, and event invitations. Please use this link rather than going through the college’s visitor program. The NC State CVM Office of Research and Graduate Studies will fund travel and meeting related expenses up to $500 for students presenting original research abstracts. Please submit this form to cvmresearchoffice@ncsu.edu at least 2 weeks prior to the meeting. Following the meeting, original receipts should be provided to determine amount of reimbursement. Travel Fund Application – here!